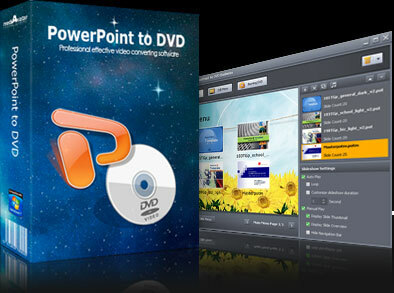 Want to preserve your PowerPoint presentations in a Home DVD disc and protect them from modifying? Or share them with others for whatever purposes like product promotion or company propaganda? Well, you need this mediAvatar PowerPoint to Home DVD to help you. Convert PowerPoint (PPT) presentations in nearly all formats including ppt, pptx, pptm, ppsx, pps, ppsm, potx, potm and pot to Home DVD discs, Home DVD folders or ISO image files with ease. Create stylish Home DVD menus, record commentary into PPTs during rehearsing, add background music/recorded commentary/watermark to PPTs, set play mode of your PPT DVD, adjust a variety of parameters such as TV standard, video quality and video aspect ratio, and many other features are awaiting for your exploration. Create PowerPoint DVD using mediAvatar PowerPoint to DVD now, make the PowerPoint presentations easier to deliver and share! Convert PPTs in most formats including ppt, pptx, pptm, ppsx, pps, ppsm, potx, potm and pot and burn PPTs to DVD discs compatible with DVD players. You can also create ISO images or DVD folders from PPT presentations. Build a DVD menu freely by choosing your favorite one from dozens of menu, and also add background music/pictures into the menu. Rehearse your presentation and record commentary during rehearsal, add background music and watermark to make them distinctive, and customize PPTs further before burning them into DVDs. Two flexible play modes are offered: manual and auto. In manual mode, you can jump to any slide; while auto-mode will play the presentations automatically after starting. Thumbnail and outline list on slides are available which enable you to find the slide you need quickly and easily (Manual playing mode only). mediAvatar PowerPoint to DVD can transfer all the original features in PPTs like audio/videos/animation/effects to target DVDs. Only three simple steps to burn PPTs to fine-quality DVDs: import PPT presentations, insert a blank DVD disc and hit “Burn” button! Besides setting background music for the whole PPT file, you are also allowed to add different background music to each slide. You can skip the DVD menu to start playing PPTs straightforwardly. More DVD settings are adjustable before burning PPTs to DVD, like TV standard, write speed, copies, video quality and video aspect ratio. You can burn PPTs to DVDs of various types: DVD-R, DVD+R, DVD-RW, DVD+RW, DVD+R DL, DVD-R DL, DVD-5 and DVD-9. Auto-exit application, shut down, hibernate the computer, stand by or do nothing. Set an action to automatically perform it after tasks is complete. Multi-lingual interface is available: English, French, Italian, Spanish and German. Drag and drop your PDF files and it doesn't require Adobe Acrobat or Adobe Reader while converting PDF to PPT.